Transform limp and lifeless locks with the Clean Luxury Hair Care Collection from Gloss Moderne. The lavish set contains a shampoo, conditioner, mask and serum that work in harmony to leave hair feeling smooth, soft and revitalised with a brilliant glossy finish. Featuring the exclusive signature fragrance of Coco de Soleil, reminiscent of the French Riviera. Free from parabens and sulfates. An effective, quintessential cleanser that’s ideal for all hair types. Producing a luxurious lather or tiny champagne-like bubbles, the lush treatment sweeps away dirt and impurities to leave hair clean and refreshed. Fortified with protein-rich Keratin and naturally antiseptic Cocoa extract, it prolongs hair color and strengthens individual strands. 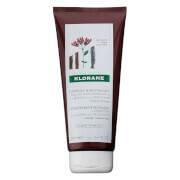 Fall in love with your hair again with this nourishing conditioner. Balancing Keratin with lush botanical extracts including Mango and Papaya, it smoothes and hydrates the cuticle for sleek, more manageable locks replenished with a radiant shine. Offering optimum thermal protection and enhancing shine, the leave-in treatment creates a mega-lacquer finish. Infused with Cocoa Butter and Coconut Oil, the hydrating serum seals cuticles and shields from heat damage for sleek, glossy locks enriched with a delectable blend of Papaya, Mango and Guava extracts. Suitable for all hair types, the luxurious hair mask smothers locks with hydrating Coconut Oil and Shea Butter, eliminating dryness and balancing optimum moisture levels. Fortified with protein-rich Keratin, the ultra-concentrated deep conditioner combats frizz and helps repair damage without weighing hair down. Conditioner: Massage through to ends. Rinse. Serum: Apply liberally to damp or dry hair. Masque: Massage into wet hair for 5+ minutes. Rinse. Shampoo: Water, Disodium Laureth Sulfosuccinate, Sodium Lauryl Sulfoacetate, Sodium Cocoyl Isethionate, Lauramidopropyl Betaine, Sodium Lauroyl Sarcosinate, Cocamidopropyl Hydroxysultaine, Cocamidopropylamine Oxide, Decyl Glucoside, Polyglyceryl-3 Laurate, Sodium Lauroyl Oat Amino Acids, PPG-3 Benzyl Ether Myristate, Coconut Oil Glycereth-8 Esters, PEG-7 Glyceryl Cocoate, Glycerin, Amodimethicone, Cinnamidopropyltrimonium Chloride, Guar Hydroxypropyltrimonium Chloride, Bertholletia Excelsa Flower Extract, Keratin, Fragrance (Parfum), Hydrolyzed Keratin, Panthenol, Glycol Distearate, Theobroma Cacao (Cocoa) Extract, Passiflora Incarnata Fruit Extract, Plumeria Rubra Flower Extract, Carica Papaya (Papaya) Fruit Extract, Mangifera Indica (Mango) Fruit Extract, Psidium Guajava Fruit Extract, Hydrolyzed Vegetable Protein PG-Propyl Silanetriol, Leuconostoc/Radish Root Ferment Filtrate, Quaternium-91, Disteareth-75 IPDI, Laureth-9, Trideceth-12, C11-15 Pareth-7, Citric Acid, Disodium EDTA, Potassium Sorbate, Chlorphenesin, Phenoxyethanol, Methylisothiazolinone, Benzyl Alcohol, Coumarin, Limonene. Conditioner: Water, Cetearyl Alcohol, Glycerin, PPG-3 Benzyl Ether Myristate, Cetyl Esters, Cyclopentasiloxane, Behentrimonium Methosulfate, Cocos Nucifera (Coconut) Oil, Dimethiconol, Cetrimonium Methosulfate, Cinnamidopropyltrimonium Chloride, Amodimethicone, Isosteareth-200 Linoleate, Bertholletia Excelsa Flower Extract, Keratin, Hydrolyzed Keratin, Fragrance, Panthenol, Guar Hydroxypropyltrimonium Chloride, Theobroma Cacao (Cocoa) Extract, Passiflora Incarnata Fruit Extract, Plumeria Rubra Flower Extract, Carica Papaya (Papaya) Fruit Extract, Mangifera Indica (Mango) Fruit Extract, Psidium Guajava Fruit Extract, Polyquaternium-4, Quaternium-91, Hydrolyzed Soy Protein, Hydrolyzed Vegetable Protein PG-Propyl Silanetriol, Hydroxyethylcellulose, Cetrimonium Chloride, Leuconostoc/Radish Root Ferment Filtrate, Laureth-9, Trideceth-12, Pentaerythrityl Tetra-di-t-butyl Hydroxyhydrocinnamate, C11-15 Pareth-7, PPG-1-PEG-9 Lauryl Glycol Ether, Citric Acid, Aminomethyl Propanol, Tetrasodium EDTA, Caprylyl Glycol, Sorbic Acid, Chlorphenesin, Phenoxyethanol, Methylisothiazolinone, Benzyl Alcohol, Coumarin, Limonene. Serum: Water, C12-15 Alkyl Benzoate, Cetearyl Alcohol, Phenyl Trimethicone, Butylene Glycol, Behentrimonium Chloride, Cyclopentasiloxane, Amodimethicone, Theobroma Cacao (Cocoa) Seed Butter, Cocos Nucifera (Coconut) Oil, Dimethicone, Hydroxyethylcellulose, Bertholletia Excelsa Flower Extract, Keratin, Hydrolyzed Keratin, Fragrance, Panthenol, Theobroma Cacao (Cocoa) Extract, Passiflora Incarnata Fruit Extract, Plumeria Rubra Flower Extract, Carica Papaya (Papaya) Fruit Extract, Mangifera Indica (Mango) Fruit Extract, Psidium Guajava Fruit Extract, Polyquaternium-4, Polyquaternium-37, Hydrolyzed Soy Protein, Hydrolyzed Vegetable Protein PG-Propyl Silanetriol, Sorbitan Stearate, Propylene Glycol Dicaprylate/Dicaprate, Leuconostoc/Radish Root Ferment Filtrate, Polysorbate 60, Cetrimonium Chloride, Styrene/Acrylamide Copolymer, Trideceth-12, PPG-1 Trideceth-6, PPG-1-PEG-9 Lauryl Glycol Ether, Citric Acid, Aminomethyl Propanol, Disodium EDTA, Potassium Sorbate, Sodium Benzoate, Chlorphenesin, Phenoxyethanol, Benzyl Alcohol, Coumarin, Limonene. Masque: Water, Cetearyl Alcohol, Cyclopentasiloxane, Cetyl Alcohol, Emulsifying Wax NF, Stearamidopropyl Dimethylamine, PPG-3 Benzyl Ether Myristate, Glycerin, Isododecane, Cetyl Esters, Behentrimonium Methosulfate, Butyrospermum Parkii (Shea Butter), Theobroma Cacao (Cocoa) Seed Butter, Dimethiconol, Cetrimonium Methosulfate, Cinnamidopropyltrimonium Chloride, Bertholletia Excelsa Flower Extract, Keratin, Hydrolyzed Keratin, Fragrance, Panthenol, Theobroma Cocoa (Cocoa) Extract, Passiflora Incarnata Fruit Extract, Plumeria Rubra Flower Extract, Carica Papaya (Papaya) Fruit Extract, Mangifera Indica (Mango) Fruit Extract, Psidium Guajava Fruit Extract, Polyquaternium-4, Quaternium-91, Hydrolyzed Soy Protein, Hydrolyzed Vegetable Protein PG-Propyl Silanetriol, Cetrimonium Chloride, Leuconostoc/Radish Root Ferment Filtrate, PPG-1-PEG-9 Lauryl Glycol Ether, Citric Acid, Disodium EDTA, Caprylyl Glycol, Sorbic Acid, Chlorphenesin, Phenoxyethanol, Methylisothiazolinone, Benzyl Alcohol, Coumarin, Limonene.